Web hosting has seen some serious developments and innovations in recent years. Many industries have noticed the significance of cloud computing, cloud-based applications, and technologies as a vital tool to up-time their performance and total productivity. Big enterprises and companies are embracing innovative technologies because they have detected the advantages that cloud hosting can bring to their companies. Now companies are on a hunt for the perfect hosting solution and are looking for affordable, yet optimal, solutions for multiple projects as VPS hosting or virtual private sector has exploded in the hosting industry, making the selection even tougher or critical. Stepping into the next phase of web hosting, hybrid servers have proved to yield benefits that companies are prioritizing it over traditional or any other type of web server hosting. It wouldn’t be wrong to say that it is a game changer in the truest sense, as it has undeniable benefits. Since businesses have different sets of requirements and job-specifications, the complete one-package solution is found in hybrid servers. It is a combination of public based servers and private cloud servers, which are combined together seamlessly into one platform. It is the kind of server that provides a combined power of a classic dedicated server and the flexibility of cloud networking and computing. Hybrid servers diminish tradeoffs and simply break down technical barriers to get maximum performance-benefits from each component. 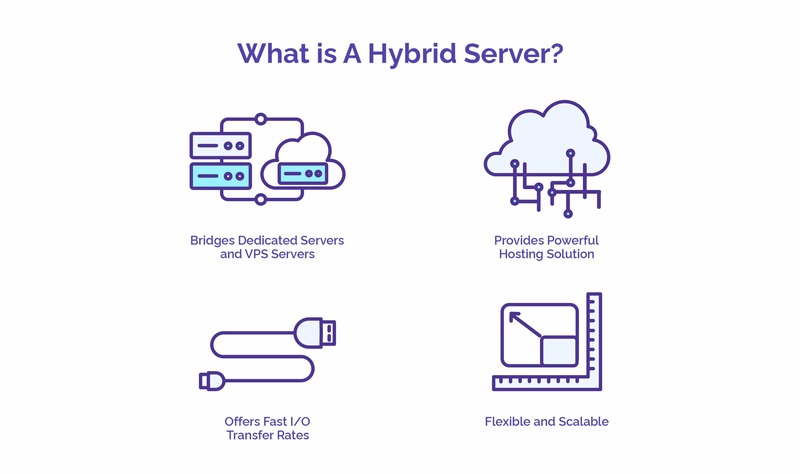 Moreover, businesses are embracing hybrid servers for a number of reasons, as it provides quantifiable benefits in terms of faster data transfer and increased privacy. The companies that used to hesitate uploading or sharing their sensitive data over different servers have now found an alternate route to secure their data via secured cloud-based networks. However, there must be a management platform or board in place in order to configure the data or network appropriately. Moreover, you can’t simply plug in an outdated server into a public cloud server or network and call it Hybrid, in fact, you have to integrate or incorporate a proper system for making an optimal use of it. Hybrid servers are best known for their all-round performance. It bridges the gap between dedicated servers and VPS servers and provides a powerful hosting solution for a wide range of applications. Traditional servers can never ever meet the super-fast I/O transfer rates and data security, which hybrid servers offer. They generally provide more flexibility and scalability, which is a dire need of large-scale businesses, which means it offers complete control and freedom to access and install any software you choose. Increased data speed allows hybrid servers to configure and push the essential data through a private server funnel instead of public ones, which ultimately increases the data transfer spend and dramatically improve load times. Sensitive data can be stored and secured on private servers with superior layers of encryption for accessing in-house, while huge chunks of publically accessed data can be assessed on a public side of the server. It provides maximum flexibility to enterprises to explore a variety of operational directions and devise optimal cloud-based solutions for them. It saves your investments and provides cost-effective solutions. When it comes to hybrid servers and security of sensitive data, it’s easy to maintain and regulate data handling and storage requirements and protocols. People have both – positive and negative experience with different sort of servers, dedicated, hybrid, cloud. At the hour of need, all of these servers have their own particular strengths and respond exceptionally well. However, a specific type of deployment requires a specific type of server. For that, optimal choices have to be made in order to reap intended results. However, hybrid servers work particularly well due to their robust and flexible nature. They are used for almost any project: testing, web hosting, back-end servers for mobile apps and many more. Large enterprises usually go for efficiency in processes, for them, hybrid servers are best for each and every perspective. A study revealed that there is a very thin line between hybrid and cloud-based servers, they both actually reinforce each other but most people don’t agree with it and consider it quite different. Cloud computing or cloud-based network may be relatively easier to manage and control but requires skillful knowledge and expertise to execute or manage it all well. However, hybrid servers can be an ultimate game changer for companies who expect to improve their overall output, productivity or performance.